I am not a sleeper lately, well better said - I can't fall asleep lately. It seems as if I need some sort of assistance to drift away into dream land. With all the ideas and tasks floating through my head, it just seems impossible to shut things off. I find myself sitting up to 1 -2 am even when I've put myself in bed by 10 pm. Problem is, I hate taking something medically and especially hate depending on a drink to help me sleep. I am constantly looking for natural sleep aids and honestly changing it up between them so my body doesn't get used to one kind. I was quite happy when contacted by a company called Glysonna and of course willing to give it a review! 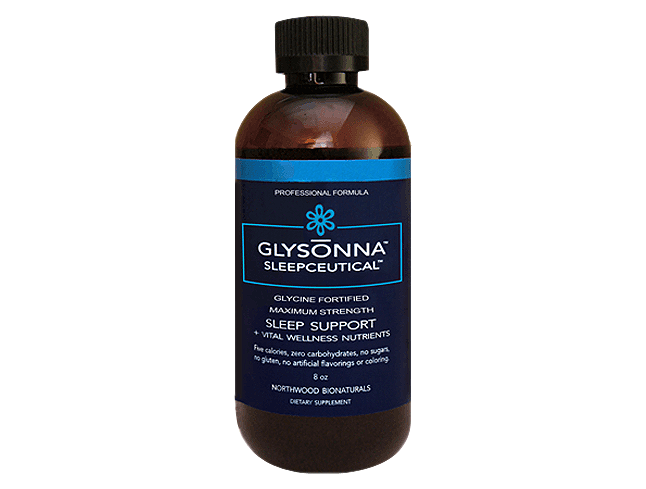 "Glysonna SleepceuticalTM is a drug-free sleep aid, glycine fortified with added wellness nutrients which helps you to reach restorative sleep." The first and favorite quality I learned about Glysonna is that you don't have to take this an hour or 30 minutes prior to laying in bed. You take 1 oz directly at bedtime. There is nothing I hate more than having to remember to take something and then waiting for it to work. I can honestly tell you, I felt it "work" almost within minutes. "Glysonna contains eight active ingredients – Glycine, L-Theanine, JuJube Extract, Phenibut, Hops Extract, Passion Flower Extract, Cinnamon Extract and Melatonin – and seven wellness ingredients – Vitamin D, Vitamin B6, Zinc, Selenium, Niacin and Magnesium." I have to say, this tasted amazing! It had a combination of a warm chai tea or hot cider - very relaxing and soothing flavor! Even better Glysonna contains no sugar, carbs, or gluten! There is also no antihistamines, alcohol, tryptophan and 5HTP. "Glysonna has successfully granted a good night’s rest to patients of long-term disorders such as sleep apnea, insomnia and PTSD in addition to individuals who just occasionally have a rough time initiating and sustaining sleep." Unfortunately I have to say one of these things I noticed while taking this is a very odd feeling while falling asleep almost as if I was in a drunk state. I felt like my crazy thoughts were a bit enhanced which in my opinion might not be good for individuals taking this when not in bed, ready for sleep. I was surprised though, when I awoke in the morning feeling refreshed and had actually slept for a solid eight hours. I wasn't "knocked out" and yet I still don't remember struggling to fall asleep. I also remembered that I actually had dreams even though I don’t recall what they were about. I don't feel groggy when waking up after taking this like I have with other products and for instance I feel refreshed enough to be writing away today! Recommendation: I highly recommend this problem if you are having mild problems sleeping. I do not think this is a cure for insomnia (as this is something that only happens to me when I am extremely stressed). It works to help when I can not turn my brain off and is honestly a more natural way which I feel more comfortable using. I think this is great tasting and most importantly it works effectively. Giveaway: Glysonna is going to give one of A Lucky Ladybug's lucky readers an 8oz bottle of Glysonna to try of their own! I like to relax with a warm bath before bed to help me sleep. Melatonin usually helps me sleep. I have trouble sleeping but I think biofeedback and cal/magnesium drink helps. When I lay in bed doing crossword puzzles, it really helps me go to sleep. Being super tired is usually the best way. Otherwise, yeah, I have trouble. I use melatonin alot to sleep. Nothing helps me sleep :( That's why I want to try this! I have trouble falling asleep (an hour or more) but sleep through the night once I get to sleep. I think this would help me. I like that you have your giveaways in the sidebar. I like the list of giveaways in the sidebar. I do have a hard time sleeping. I try to take a hot shower and use essential oils to relax at night. A warm bath before I go to sleep helps. I have a very difficult time falling asleep, I am currently having to use prescription medicine to help me fall asleep but I hate to be dependent on prescriptions. I have a very difficult time falling asleep, I am currently using prescription meds to help, but I hate to be dependent on prescriptions. I have trouble sleeping, currently I use eye mask with soft music. This blog is super as is! I like everything about it. I am a terrible insomniac, and have been for years. Nothing I've tried (and I have tried everything) has been much help at all. I usually just read myself to sleep, which can take hours sometimes! I am not a chronic insomniac but I do have bouts of insomnia periodically. I have not been able to definitively say what the triggers are but I have noticed a correlation with stress. it usually helps to have a cup of lavender tea, put a warm relaxing pack on my neck and shoulders, and have absolute dark in the room. It doesn't always help me actually sleep but I do usually get some rest. I like to drink herbal tea when I can't sleep at night which is at least 3 times a week. I put a relaxing smelling lotion on and read for a little while. That helps me relax and fall asleep faster. It is more so my fiance that has trouble sleeping at night than myself. He doesn't know why and can't quite pinpoint when it started but he has tried everything. Pills, lotions, sprays, you name it! I love that you are willing to hold a linky for low entry giveaways! I have already won a couple times from your blog and haven't even been participating for that long! The past few months I have started having trouble staying asleep through the night. So I started taking an herbal supplement, Valerian Root, which has certainly helped me. Also, reading a book before bedtime helps slow my brain down, so I can fall asleep faster.